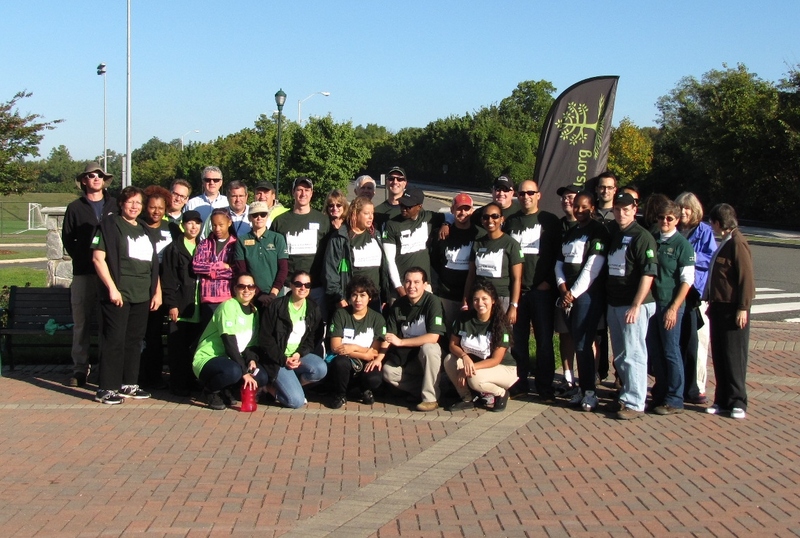 On October 15, 2013, twenty-five TD Bank employees with the guidance of TreeSteward volunteers planted 30 trees in Tarelton Park, Alexandria, Virginia. But this was only the “initial deposit” of their long term investment. 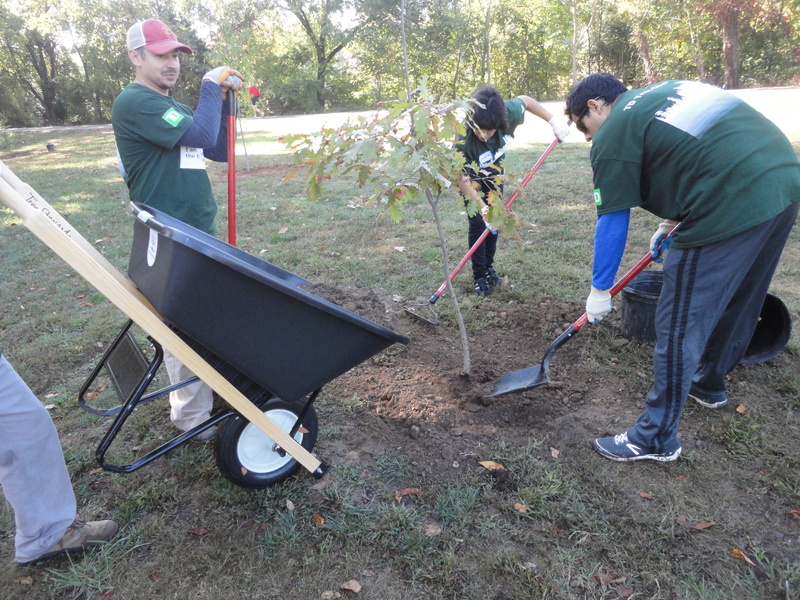 TD Bank works with the Alliance for Community Trees to not only put trees in the ground, but to also partner and strengthen the capacity of local groups. They helped TreeStewards with a grant that allowed purchase of the young saplings and to purchase shovels, gloves, rakes, wheelbarrows, hoses, etc. for ongoing tree planting events. They further “insured their investment” by requiring and funding two years of watering for the young trees. 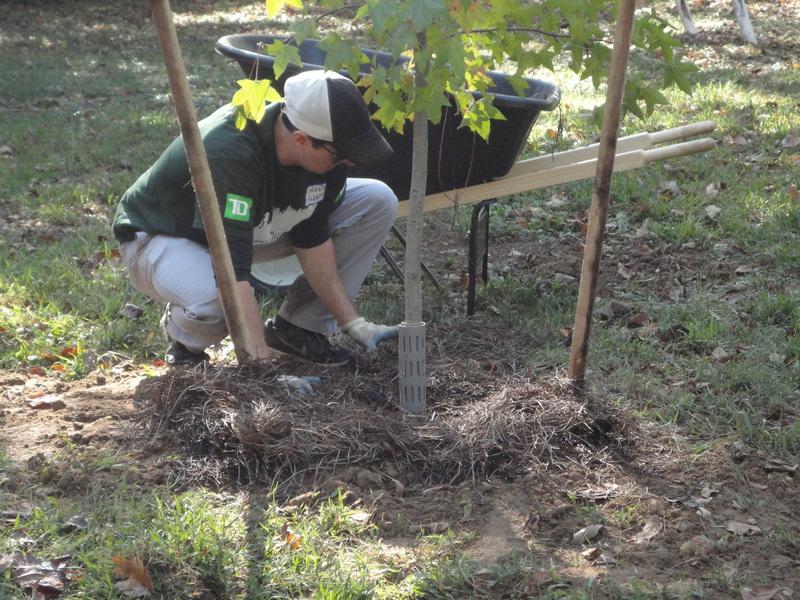 TD Bank volunteers used pickaxes on the rocky ground, hauled water long distances, and worked unceasingly. It was a perfect event due to the support of so many partners: TD Bank gave the funding and willing hands for planting, Alliance for Community Trees shared it’s expertise in planning for such events, Kramer Equipment arranged all the tools at a significant discount, Clear Ridge Native Nursery provided excellent trees, the neighborhood association president let us hook into his water line for the planting day and Alexandria Natural Resources Division got permission for planting in Tarleton Park. Final quality check: mulch away from trunk, guard on to prevent weed wacker damage, ties loose to allow strengthening trunk. A well planted tree! The residents who use the park (humans, squirrels, raccoons, birds, and so on) will now have shade during the hot day and lots of food from the River birches, Sweet gums, Swamp white oaks, Pin oaks, American hornbeams, White oaks, Northern red oaks, and Butternut hickories that were planted.